THIS MONTH KEYJAN AND DIANA ARE TALKING ABOUT TRINIDAD AND AMERICA. Diana: So the other day I was in my apartment and I went into the bathroom and there was a giant cockroach in the toilet. Keyjan: I’m from Trinidad. It’s in the Caribbean. Diana: Oh, I’ve been to the Caribbean, but I’ve never been to Trinidad before. How do you like the US? Keyjan: I love it. I’ve been here almost every summer since I was a kid. The latest issue of Hot English (169 – the June issue) is out now! Learn over 300 useful words and expressions and improve your listening skills with Learn Hot English! 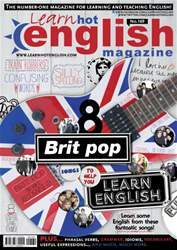 This month: How Brit Pop can help you learn English – listen to 8 song extracts and really improve your knowledge of English. Plus, 8 useful adjectives, 6 useful verbs for talking about food and drink, 7 ways to make an invitation, 8 useful phrasal verbs, 8 idioms, 8 useful phrases for talking about crime... plus: • Psychology – road rage. • Animals – brave pets. • Crime – famous robbers. • Language – confusing words. • Food – the Hot English burger. • Art – environmental art. • Culture – witches. • Vocabulary – silly spelling. • Business – the music industry. • Film – Angelina Jolie. • Phone – booking an appointment. • Slang – learn some slang with our dictionary of slang. AND LOTS, LOTS MORE! By reading and listening to all this great content, you'll improve your English reading and listening skills and learn up to 300 useful words or expressions. Plus, you'll get a better job and pass English-language exams more easily. Guaranteed!